This article is about the saurian species. For their language, see Sangheili (language). "On the blood of our fathers, on the blood of our sons, we swore to uphold the Covenant!" — Rtas 'Vadumee before the raid on the Threshold gas mine. The Sangheili (Macto cognatus in Latin taxonomy, meaning "I glorify my kin") are a saurian sapient species known for their warrior culture and combat skill. Named after their home planet, Sanghelios, they have historically been known to humans as Elites for their former role in the Covenant's military hierarchy. Originally one of the Covenant's two founding species, the Sangheili formed the hegemony's military backbone until just before the end of its existence. They had a very strong rivalry with the Jiralhanae, which finally led to open conflict during the Great Schism at the conclusion of the Human-Covenant War. After the High Prophet of Truth and the High Prophet of Mercy ordered the genocide of the entire Sangheili race during the Great Schism, the species was forced into civil war against the Covenant proper. This was established after the assassination of the High Prophet of Regret at the hands of John-117. The two remaining Hierarchs held the Sangheili responsible for the Prophet of Regret's death, and the species was seen as "unfit" to continue to guard the Prophets. The Prophets sought to achieve this through the use of the other Covenant races, primarily the Jiralhanae. Consequently, the Sangheili led a rebellion against the Prophets. A significant number of Sangheili sided with the UNSC against the Prophet-led Covenant; this alliance continued to hold in the post-war era. The aftermath of the civil war formed the bedrock of the Covenant Empire's ultimate collapse and the end of the Human-Covenant War. In the post-war years, the Swords of Sanghelios, led by Arbiter Thel 'Vadam and a grand council of kaidons, emerged as the most prominent Sangheili government. However, they were opposed by multiple factions with differing ideals of how to build a future for their civilization, and the species remained embroiled in civil war for several years while continuing hostilities with Jiralhanae groups. The Sangheili evolved in tropical wetlands of their homeworld, Sanghelios. Sanghelios had at one point been visited by or had been in contact with the Forerunners. During the Forerunner-Flood war, the Librarian visited the planet to retrieve specimens of the Sangheili for preservation aboard Installation 00. After the firing of the Halo Array, they were returned to their home planet to begin rebuilding their culture. After being returned to their homeworld, the Sangheili discovered artifacts left by the Forerunners on their planet. The Sangheili revered the objects these "gods" had left, and considered tampering with them a heresy beyond any other. However, some Sangheili scientists defied their species' dogma and studied Forerunner artifacts in secret; they would later become instrumental in helping the Sangheili reverse-engineer weapons against the San'Shyuum. Several hundred years prior to the formation of the Covenant, the Sangheili had developed slipspace technology and created dozens of independent colonies, though their homeworld of Sanghelios remaining central to governance and culture. 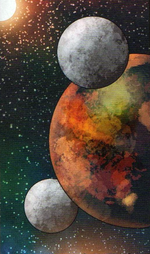 The planet of Creck, discovered before the Sangheili's contact with the San'Shyuum was the seventy-sixth of designated worlds explored by Sangheili. At some point, an unknown number of Sangheili clans waged war upon each other for numerous years on Sanghelios. These engagements became known as the Clan Battles of Sanghelios. In 938 BCE the Sangheili encountered the Reformist San'Shyuum, a race who also worshiped the Forerunners as gods, but had utilized Forerunner technology for their own needs, believing the technology had been left behind by the gods as gifts for their children. This sparked a war between the two races over how to treat the relics. Even though the Sangheili were much more physically imposing and numerous, they suffered extreme casualties under the sheer power of the San'Shyuum's Dreadnought, a surviving Keyship, and by 876 BCE even the most devout had to admit their survival depended on the reconstitution of their own Forerunner technology. This led both sides to an agreement that ended with the decommissioning of the Forerunner Dreadnought and a shaky alliance that eventually expanded into the Covenant. The San'Shyuum helped assuage the Sangheili by informing them of the Great Journey: by seeking out the Holy Rings scattered throughout the galaxy and utilizing them, a "Great Journey" would transform believers into godlike beings. The Writ of Union was drawn up in 852 BCE in order to codify the Covenant. Its first canto clearly outlines the nature of the Covenant from the perspective of the Prophets. Being one of the few races in the Covenant to achieve space-faring status without outside intervention, Sangheili interaction with the San'Shyuum was initially strained due to memories of the recent war. Many Sangheili felt that the Writ of Union meant surrender to the San'Shyuum, although most never voiced these concerns. The Sangheili Ussa 'Xellus led a major rebellion against the Covenant that was eventually neutralized with the rebel Ussans going into hiding. Over time, the San'Shyuum and Sangheili formed a prosperous relationship, eventually laying the foundation for the modern Covenant hegemony. During their membership in the Covenant, the Sangheili were simply put, technological and societal equals of the San'Shyuum. However, for a significant period, they found themselves as the dominant military muscle for the entire Covenant structure - hardly surprising given the warlike, feudal nature of their homeworld. What was surprising was the cyclical stability this feudal society was able to offer. Technological and medical advancement prospered, and the intelligent, aggressive Sangheili were peerless until they encountered the San'Shyuum. With exchange of goods and ideas, the Sangheili adapted to and eventually embraced the Covenant religion, grafting its tenets to their own belief system. Sangheili soldiers engaging UNSC Marines during the Human-Covenant war. When the Prophets declared war on a previously unknown species called humans, the Sangheili followed their lead without question. After a period of time, however, even though the Prophets insisted that the humans were "unclean beings" that must be eliminated from the galaxy, some seasoned Sangheili veterans began to question the refusal of the Prophets to even consider accepting the humans into the Covenant. They seem to believe that humans, although physically weak, at least compared to themselves, are brave and even honorable. As such, these few Sangheili believed that humans should be offered admittance to the Covenant due their ability to put up a fight on the ground. Some even believed that the humans are equal to them - a considerable step for a Sangheili, or any member of the Covenant to make. These Sangheili admired how willing and brave the humans were when fighting to survive against outright extinction, they even respected to a certain degree those few soldiers who were willing to stay behind and cover their comrades from a Covenant attack. A few Sangheili even had more respect for the humans than they did for the San'Shyuum before the Great Schism. Sangheili and Jiralhanae controlled vessels battling around High Charity. During the final months of the Human-Covenant War, the political shift caused by the High Prophet of Truth and Tartarus, the Chieftain of the Jiralhanae, started a slippery slope that ended in the dissolution of the Covenant between the Sangheili and the San'Shyuum. Originally, the Jiralhanae were viewed as savagely aggressive and extremely goal-oriented, which the Sangheili viewed as a serious threat should the Brutes ever begin to desire political power. This fear became reality when the Honor Guards of the Prophets, originally an all-Sangheili class, were transformed into a duty of the Brutes. This was directly caused by the death of the High Prophet of Regret at the hands of John-117, the human "Demon", despite Regret's protection from his personal squad of Sangheili Honor Guardsmen. Soon the Jiralhanae found themselves in new positions of power, becoming veritable replacements for the Sangheili. During the concurrent Battle of Installation 05 and the Fall of High Charity, the Jiralhanae had begun to massacre the Sangheili under Truth's orders. Additionally, Arbiter Thel 'Vadam and Special Operations Commander Rtas 'Vadum discovered the truth of the Halo rings from the Monitor 343 Guilty Spark. From this, they learned that the Prophets' promises of the Great Journey were false causing further turmoil. These events led the entire Sangheili species to secede from the Covenant, unified to bring down the empire that had betrayed them. They were aided by a few of the member species within the Covenant, such as many Unggoy and most Mgalekgolo, although many sided with the High Prophets despite the Sangheili's efforts. The secession included a movement to destroy the treacherous Jiralhanae and High Prophets, and the destruction of the Flood at all costs, eventually resulting in an alliance between the Fleet of Retribution and humanity. The Great Schism stretched from the human homeworld, Earth, all the way back to Sanghelios as the Sangheili attempted to wrest their share of the hegemony away from their new-found enemies. The Jiralhanae stepped in to fill the military void in ever increasing numbers, sensing the vacuum and opportunity left by the departure of the Sangheili. Thel 'Vadam killing the Prophet of Truth. "I am not Covenant. The Covenant is dead. It was a lie. I am Sangheili." — Jat to Dahlia on Carrow. After the Battle of Earth, the Sangheili and humans managed to stop and subsequently kill the Prophet of Truth, effectively dissolving the Covenant. However, the Sangheili and humans were coerced to deal with a more massive threat; the Flood. Finally, the Arbiter and the Master Chief, after activating the newly constructed replacement Halo ring, effectively ending the Flood threat. Following the destruction of the Covenant, Sangheili society plunged into crisis. Already lacking centralized governance and splintered to independent city-states spread across several dozen major colonies, they fractured into multiple infighting factions with varying ideas on how to run their society, despite their ongoing war with the Jiralhanae. This was largely due to the fact they had become reliant of the Prophets during the millennia of the Covenant's existence. As they regained their independence, they were forced to re-learn to manage their society on their own, without the direction of the Prophets or the manual labor provided by the other client races. During this time, Arbiter Thel 'Vadam managed to gather a sizable alliance of keeps under the banner of the Swords of Sanghelios, which became the preeminent governmental entity among the Sangheili. Many other factions, such as the Servants of the Abiding Truth, opposed Thel 'Vadam and his allies, specifically their rejection of the notion of the Forerunners being gods. As the Great Schism went on, the Sangheili continued their fight against the Jiralhanae. This was proving largely unsuccessful and the Sangheili were accepting serious losses. Without the Covenant to provide them with ships, technology, and repairs, they slowly lost warships and technologies they could not repair or replace. After the San'Shyuum went into hiding, the Sangheili began to prevail against the Jiralhanae, who in turn began to fight among themselves. Having abandoned the Covenant, the Sangheili were now in a state of mass confusion in regards to their religion, because even though the San'Shyuum lied to them, they had still given them purpose for their actions. Many Sangheili were still religiously devoted to the Forerunners and were attempting to uncover the meaning of their faith. After the Human-Covenant War, there was competition between the UNSC and the Sangheili, when it came to examining Forerunner ruins and relics like the Portal at Voi. By March 2553, a tentative ceasefire continued to exist between humanity and the Sangheili. Although Arbiter Thel 'Vadam campaigned for peace between the two species across various Sangheili states, many Sangheili continued to view humans with suspicion, perceiving them as a threat and wanting to destroy them once and for all. At the same time, the UNSC's Office of Naval Intelligence took advantage of the unstable political situation, attempting to keep the Sangheili splintered and disorganized by inciting the Servants of the Abiding Truth, led by Avu Med 'Telcam, to rebel against 'Vadam. This was to ensure the Sangheili would not pose a threat to humanity again, in spite of the UNSC's alliance with the Arbiter's faction. ONI's aid allowed the Servants of the Abiding Truth to amass enough weapons to begin an all-out insurrection against 'Vadam and his allies in early 2553. Meanwhile, however, ONI's efforts also backfired; partially as a result of their actions the Sangheili Jul 'Mdama began a personal quest against humanity, forming a Sangheili-led reconstituted Covenant mainly from ex-Covenant forces. Four years after the battle at the Ark, this group launched an invasion on the Forerunner shield world Requiem, intending to find and awaken the Didact, a Forerunner Promethean they revered as a living god. Joint UNSC-Swords of Sanghelios operation on Installation 00. In spite of ONI's underhanded mission, relations between humanity and Sangheili at large continued to be amicable. For example, the UNSC and the Sangheili under the Arbiter maintained mixed control over certain space territories, known as Joint Occupation Zones. The UNSC and Swords of Sanghelios participated in joint operations, including the Mission to Installation 00, where they successfully prevented the reactivation of the Halo Array and an attack on Earth. The UNSC Navy and the Sangheili also participated in joint naval operations, including one against pirates in 2557. Human and Sangheili scholars also gathered and studied the Covenant's records together on Sanghelios. Collaborative weapons research (such as the study of the physics behind the Type-33 Needler) and exchanges in military intelligence between the two species is also known to have taken place. In addition, a select number of Sangheili are known to have been offered the opportunity to train alongside Spartan-IVs in War Games simulations as part of the ANVIL initiative. A notable example of trust and technological exchange between humanity and Sangheili is the Helioskrill armor, a variant of MJOLNIR Powered Assault Armor, one of the most sophisticated pieces of human technology, which was designed by a Sangheili prodigy and manufactured by the Kolaar Manufactorum, a forge based on Sanghelios. Not all humans were amicable towards coexistence with the Sangheili, as seen with the Sapien Sunrise. In one notable incident, nine members from the aforementioned terrorist organization infiltrated Richard Sekibo's delegation at a peace summit on the colony world of Biko. They intended to assassinate Sekibo and a Sangheili delegation while framing the Sangheili of the crime. The assassination attempt was foiled by Spartan John-117 though Sekibo was mortally wounded. Unfortunately, the truth was covered up and John-117 was used as a scapegoat to hide the UEG's laxity towards preventing the attack, much to the frustration of the Sangheili delegation. Later John-117's name was cleared. During the crisis that followed the dissolution of the Covenant, some Sangheili sought asylum on Earth. In 2558, at least one settlement of former-Covenant races was based in the South American city of Rio de Janeiro. In one notable incident, the Office of Naval Intelligence deployed three prowlers to trail the allied Sangheili assault carrier Shadow of Intent. All three stealth vessels were reported destroyed under unclear circumstances; the losses were not reported to UNSC Naval authorities. Despite this, the alliance between the Arbiter and humanity continued to hold. On March 5, 2558, 'Vadam accepted the UNSC as mediators to oversee his peace negotiations with the Jiralhanae Chieftain Lydus. However, the negotiations were put on hold due to an attack by New Colonial Alliance mercenaries. On October 28, 2558 the Swords of Sanghelios emerged victorious over Jul 'Mdama's Covenant at the Battle of Sunaion. Sanghelios became a safe haven for surviving UNSC forces after the Created took control of Earth and most human colonies. Sangheili are physically imposing beings, typically standing more than a foot taller than the average human. They are vaguely reptilian in overall appearance, with leathery skin, reverse-jointed legs and sharp claws and teeth. Their large hands have two fingers and two thumbs. Their most distinguishing trait is their jaw structure, which is made up of four separate mandibles attached to their face. Sangheili are intelligent, agile, and strong, and are often characterized by their bravery and honor. Sangheili warriors augment these natural abilities further through use of energy shields integrated into their armor. Depending upon rank and mission objective, they are commonly seen in battle with plasma rifles, carbines, needlers, needle rifles, along with their cultural signature weapons, energy swords. Sangheili employ coffin-like orbital insertion pods as well as Spirit and Phantom dropships for military transit purposes and rapid-response operations. Historically, Sangheili have followed the Covenant mentality of maintaining hatred towards humanity, believing them to be an affront to their religion and a challenge towards the Great Journey. However, many Sangheili were able to put this animosity aside when an alliance of Sangheili joined the UNSC during their expedition to the Ark. After the Human-Covenant War, many Sangheili are still distrustful of humanity and some still wage war against them. Nonetheless a large number of Sangheili, most notably those loyal to Thel 'Vadam, have attempted to form steady alliances with their former enemies. Sangheili internal organs. This wound reveals the rib cage, esophagus, hearts, intestine, and other organs. Sangheili are muscular and very tall, usually standing between 2.25 and 2.62 meters (7.38 and 8.6 feet), though they often seem slightly shorter due to their usual hunched position. Their jaws are quadruple-hinged, with an upper jaw and four lower mandibles arranged in two tiers. Mandible and upper jaw structure along with teeth shape and numbers result from different phenotypes; however they do not indicate reproductive isolation. These mandibles have between six and twelve teeth each and some Sangheili have an additional, larger fang on the tips of each mandible. Anywhere from eight to more than a dozen broader teeth may be mounted on the upper jaw structure. Adult Sangheili mandibles can be found in varying shapes, sizes, and ranges of dexterity, and are as distinctive as a human fingerprint. Some Sangheili also possess molars. Sangheili smell with the use of two nostrils, each slightly in front of and below the eye socket. Given their predatory nature, a Sangheili's sense of smell is likely very developed. Their hands are tetradactyl, each having two fingers in the middle and an opposing thumb on either side. Contrary to what their anatomy might suggest, Sangheili could release a loud, sharp and piercing whistle by placing their thumbs on the same hand into their mouths and blowing through the narrow gap. Their legs are digitigrade, with short upper and lower legs, and elongated tarsals, using the distal and intermediate phalanges to support their weight when walking. This arrangement possibly allows them to run very quickly and jump large distances, compared to ordinary humans and other Covenant races. Their superior agility may also be attributed to their homeworld's higher gravity; the additional strength required to move normally in a high-gravity environment would likely cause them to be more powerful in lower gravity situations (though, curiously, their tall, large, and lean figure would be extremely disadvantageous and impractical on a high-gravity planet—an arrangement possibly allowed by other major factors in their biology and life cycles; alternatively, the impressive strength and agility may be the result of the capabilities of their standard-issue combat harnesses). They also appear to have a double set of pectoral muscles, which contributes to their incredible strength. On the other hand, their digitigrade stance makes it difficult for them to climb vertical constructs such as ladders. 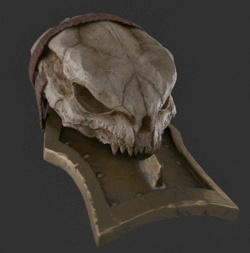 A Sangheili skull which was mounted on a pauldron worn by Tartarus. Sangheili have a binary circulatory system that pumps indigo-colored blood. They breathe oxygen and their homeworld has a nitrogen-oxygen atmosphere comparable to Earth's, allowing them to breathe the same atmosphere as humans. Sangheili cannot breathe molecular nitrogen. Sangheili exhibit minor sexual dimorphism, with the females being slightly smaller than the males. Sangheili males possess a subtle leathery scent, while females have been described as smelling like "clean feathers". Sangheili are oviparous, meaning that they lay eggs rather than giving live birth. They incubate their recently hatched young in tank-like pods. The species is remarkably long-lived; Sangheili over 60 or 70 years of age have shown to be fully fit for combat duty, and Jul 'Mdama was considered young, at least in keep elder terms, at 64 years old, while by 851 BCE, 'Crecka was over 90 years old. Circa 100,000 BCE Sangheili life expectancy was 27 Earth years. An example of Sangheili's mentality of being a superior species; here, Thel 'Vadamee defies a Jiralhanae to handle him after a trial. Although Sangheili are naturally very intelligent, their culture's long dependence on a military-industrial schema has led to an emphasis on might over science. In some regards, the advent of the Covenant made this position easier, allowing the Sangheili to concentrate even more monomanically on military endeavors, while Prophets took care of science and technology. Despite this, their adeptness at using and creating technology is evident. Raised from childhood to be warriors, other societal roles are treated as secondary endeavors or even hobbies. Doctors are considered outright dishonorable as they "spill blood" outside the battlefield; despite this, the Sangheili are known to employ advanced medical technology that is superior to humanity's. Few doctors exist within Sangheili society. Instead, Huragok and other species are employed as medical personnel. Most injuries sustained by the Sangheili can easily be treated by the medical technology employed by the species, otherwise they accept their fate. However, Sangheili hold disdain for using medical technology to treat themselves and some personally would rather suffer through their injury or die. There is evidence of this being overturned, however. Some Sangheili recognize that other species do not share the same views on medical treatment and were willing to lend them their medical technologies or even treat the wounded individual themselves. Sangheili are trained to be skilled in most ranged weapons, as well as hand-to-hand combat. A prominent example of this martial focus is that only aristocrats are allowed to wield energy swords and that sword-wielders are then no longer eligible for marriage; however, they may breed with any female they choose, married or otherwise, to ensure successful transmission of "swordsman" genes. Many Sangheili children are trained in basic swordsmanship early on, both for personal development and for them to be capable of using a sword later in life if necessary. Within the military, an aristocratic title is not necessary for wielding an energy sword. Military promotion among the Sangheili is by merit. A Sangheili soldier must succeed to advance among the ranks, with this success being measured in combat kills. A Sangheili near the top of the military hierarchy may have personally slaughtered thousands of individuals to reach that status. This practice sometimes puts individuals of questionable strategic acumen in positions of command. In the case of Ripa 'Moramee, a particularly brutish Sangheili was appointed as Arbiter, both for his martial ability and for his unquestioning obedience to the Prophets. Historically the Sangheili have considered most other species to be inferior to them, both culturally and in fighting skill; this thinking has caused Sangheili to treat other species cruelly and in an arrogant manner. This eventually led to the feud between the Sangheili and Jiralhanae. In the years following the Great Schism the Sangheili entered a period of cultural renaissance however, triggering a rethinking towards their practices under the Covenant. This included views on medicine, secularism (seen in the war between the theocratic Covenant and secular Swords of Sanghelios), gender roles, and technology, and there was also evidence to suggest that views on other species underwent a gradual ongoing alteration too. It was noted that an Unggoy was able to take command of Sangheili and lead them in such a way so as to inspire respect and admiration from them. This was unprecedented given the past observed relationship between the two species. The longstanding feud between the Sangheili and Jiralhanae was well documented, but in 2558 Thel 'Vadam engaged in peace talks with a Jiralhanae Chieftain known as Lydus on Ealen IV. Lydus accused Thel of engaging with the talks so that the Sangheili could simply acquire Jiralhanae resources, however Thel rebutted the notion with the idea that the Sangheili cared for more than just that. Olympia Vale conversing with a member of the Swords of Sanghelios. One great indicator of the Sangheili's evolving attitudes towards other species was their interactions with humans in the decade following the end of the Human-Covenant War. During and immediately after the conflict, many Sangheili espoused the Covenant's position towards humans as being heretics, and humans were subject to much of the same cultural arrogance from the Sangheili that the other species received; perhaps worse. Even by 2552, however, a growing number of human sympathizers existed among the Sangheili youth, and by 2558, the social landscape within the Swords of Sanghelios appeared drastically different with regards to humans. Specific examples include the development of a GEN-2 Mjolnir variant known as Helioskrill armor by a Sangheili weaponsmith, training programs involving Spartan-IVs and Swords of Sanghelios troops in the ANVIL Initiative, joint-operations between UNSC and Swords of Sanghelios in the joint-occupation zone against pirate raiders, cooperative weapons and technology research and development (Such as with regards to the Needler and the ANUBIS-class Mjolnir variant's enhanced sensors) as well as other cooperative endeavors between the two powers (Archivist teams and Zeta Halo containment efforts). The obvious practical nature of much of these endeavors strongly implies that the Sangheili have come to view humans as a worthy investment, investor and ally, which is in stark contrast to their culture of 10 years past. Even in more remote locations on Sangheili colonies the culture appeared to be undergoing remarkable change. It was noted by Olympia Vale during her travel to Khael'mothka that she met many Sangheili who had become tired of the war and who were intrigued by the idea of a human staying with them. There were of course those who would try to harm Vale if they could, however she learned who to stay away from and for the most part found herself in no personal jeopardy. There were of course many who refused to change their ways, such as Jul' Mdama's Covenant, and this was highlighted by the Sangheili civil war. However as of the emergence of the Created, the Covenant appear to have been almost entirely wiped out by Swords of Sanghelios forces implying that progressive factions in Sangheili society eventually won out. "What madness Sangheili honor can be. They should be careful, lest they lose their way." Major Thel 'Lodamee challenges John-117 to an energy sword duel. The Sangheili display respect and admiration for honorable fighters, whether they are allies of the Sangheili or not; it is not unusual for the Sangheili to have such an admiration for their adversaries. Sangheili respect and revere veterans and often follow their lead. Their history is rife with victorious combatants welcoming the defeated enemies' remaining forces into their own army, provided of course that they fought with honor. During the Unggoy Rebellion, the most tenacious of the Unggoy who survived the conflict were admitted for the first time into previously all-Sangheili forces, much to the Prophets' discontent. Despite their intelligence, the Sangheili often allow their obsession with honor to cloud their better judgement. The Sangheili usually employ complex strategy only if it either improves success in battle, allows them to inflict more casualties on their enemies, or if it conforms to their code of honor. Otherwise, in both tactical and strategic combat, Sangheili generally charge their enemies with reckless aggression, regardless of any damage they sustain. Only very seldom do they admit temporary defeat. While lower-ranked Sangheili might make numerous tactical mistakes, especially the Minors, such as standing in the open rather than taking cover, more experienced Sangheili tend to lure their enemies into traps and quickly dispatch them in close combat. Sangheili often sustain heavy casualties in the fervor to kill, though they use their client races to screen and protect themselves. The race's desire for grandeur has led to their defeat in many engagements, such as the Battle of Psi Serpentis, Operation: FIRST STRIKE, and the Onyx Conflict. One of the clearest examples of how zealous the Sangheili are for honor comes from when Thel 'Vadamee engaged the UNSC during his time as Supreme Commander, when Thel and two Special Operations Sangheili attacked an unarmed 3rd Battalion Reserves during the assault on the planet Camber. When Thel saw the humans unable to defend themselves, he dropped his Type-25 plasma rifle and activated his active camouflage so the Marines could gear up and have a chance to fight. This was the first time the humans documented the Sangheili strive for honor, even if it endangered themselves or others. Conversely, those who favor practicality over religious fervor in combat exhibit keen tactical and strategic acumen. The Zealots, despite being among the most fervent adherents of the Covenant's religion, use shrewd, pragmatic tactics and are willing to engage in subterfuge in lieu of open combat. Similarly, special operators and stealth specialists use active camouflage even in combat, though most would prefer to fight outright than to skulk in shadow. The separatist Fleet of Retribution destroyed the Prophet of Truth's fleet, despite the latter outnumbering the former three-to-one. Some Sangheili, such as Jul 'Mdama, see honor as more of an aspiration than a way of life and are willing to engage in deception if need be, particularly after seeing humans use such tactics to great effect. The Sangheili honor code is similar to a few throughout human history, sharing concepts such as skill in combat (with an emphasis on swordsmanship), loyalty to master and family/clan, and views on death. Both systems promote death in battle as being the most honorable and proper way to die. If a warrior is critically injured, incapacitated, or captured, the only acceptable recourse is to commit ritualistic suicide, ensuring one's honor is kept intact. This is of such importance to Sangheili warriors that even if they are incapable of killing themselves, they may request the assistance of their fellow Sangheili in doing so. The Sangheili consider being captured in combat to be dishonorable. To retain his honor, a valiant Sangheili would typically commit suicide while in prison. Often when imprisoned Sangheili are freed those who have not killed themselves are executed anyway, as was the case with one of Thel 'Vadam's ancestors. However, escaping or staging an uprising is acceptable, by the same example. Despite their martial nature, the Sangheili have reservations to the spilling of one's own blood. This is an extension of the belief that the blood of a warrior is his essence, which is synonymous with his honor; thus, to spill one's blood is to lose one's honor. As a result, in Sangheili culture, doctors are seen by many as the lowest members of society because they "make [their] living slicing and causing another Sangheili to bleed without honor." This means that the only 'honorable' way for a Sangheili to be injured or bleed out is from combat with the enemy. This belief also makes visiting a doctor very shameful for some Sangheili. The Sangheili seldom view personal weapons as anything more than tools of war, and rarely attach extra importance to a weapon simply because it once belonged to a great warrior. This was especially true during the Covenant's days, when weapons were mass-produced and warriors did not carry customized weapons. However, certain historical weapons, such as the End of Night, were so famous that they were said to possess a small part of the owner's heart, and were given names as a result. Many Sangheili believe that a weapon is to be drawn only if it is to be used, because a drawn weapon "demands blood." However, it appears that the user's intention when it is being drawn matters more than the weapon actually being used. For example, a Sangheili may draw his weapon when he is not sure if an incoming dropship contains friends or foes, only to deactivate it upon seeing friends exit the dropship. As a symbolic gesture of love for his people, a Sangheili leader may choose to walk among his followers and help them in their duties, even doing what is normally considered females' work such as helping them care for eggs. This is also done to inspire the Sangheili to work diligently so as to not be outdone by their superiors. The Sangheili have no unified government; they are splintered into numerous feudal, meritocratic states. A given state is governed by a single clan residence and assembly house known as a keep, headed by a kaidon selected by a council of elders. There are usually a number of "client keeps" belonging to different clans under the leading keep's rule, though a state's elders will assume the kaidon's clan name as a title signifying their position, regardless of the name of their own family keep. Sanghelios was once governed by the Council of City States during the early history of the Covenant. In Sangheili culture, it is customary to settle disagreements with authority by assassination, though one has to use personal weapons in order for the practice to be considered honorable. For example, if a council elder believes that his vote was ill-advised or had second thoughts, it is considered a tradition for council elders to initiate some form of attack, such as sending assassins, against the kaidon in order "...to test the true merit of [the] ruler's martial abilities." The belief was that "a kaidon who could not defend himself was not a true leader." Should the attack fail, the responsible elder will be executed immediately, and his family will be killed. However, punishment for this form of failure was usually flexible. As such, if the elder did something honorable, such as attack the kaidon himself, or attempted to make a final stand against the kaidon, then he would probably have managed to save his family from certain death, although they might still be banished. Family history and lineage are greatly valued, with each family having their own unique "battle poem" and "saga wall" detailing the deeds and actions of its members during times of war. Although Sangheili society is classified as being patriarchal, and while most males serve as warriors, female Sangheili hold considerable power in issues within their family keeps, including political matters, civil duties and trade, while Sangheili males are sent into service as warriors. The status quo of gender roles in Sangheili society has lately been challenged however by the Swords of Sanghelios, as Olympia Vale noted after meeting female pilot Mahkee 'Chava. Sangheili females have access to records of their own bloodlines, and are able to choose their mates. The maintaining of a clan's familial records is typically the duty of the wife of the keep elder. The concept of divorce is completely foreign to Sangheili. Sangheili warriors form very close-knitted relationships, referring to their comrades as "brothers" or "sisters" and remaining intensely loyal to them. This loyalty is shown in the custom of grieving after the death of a fallen comrade, a ritual which includes prayer for the dead warrior. Newly hatched Sangheili are called "childlings", and as they grow older, they are then referred to as "younglings". During the first decade of their lives, Sangheili children have protective scales that hang from their necks, an evolutionary holdover from the days when the Sangheili used to carry their offspring with their toothy mandibles away from danger. Sangheili children are typically raised in the communal environment of their family keep to ensure that all start on an equal footing and progress in rank by merit of their abilities. They are not allowed to know the identity of their true fathers and are usually raised by a maternal uncle instead. This is a method of preventing status from being inherited in order to force children to make their own way in the world so they actively work for and earn advancement, thus minimizing nepotism and promoting loyalty to the whole clan rather than their parents. However, as some children's fathers are swordsmen who have been granted the right to reproduce with any number of female Sangheili they desire, the use of a maternal uncle as a father-like figure is used to allow children to be raised equally. Sometimes the individual acting as a Sangheili's "uncle" is in fact the father, but this makes no difference to his role as the child will never know. While traditional on Sanghelios, the custom of Sangheili children not knowing their fathers is not followed on all Sangheili-occupied worlds, particularly ones with smaller populations and tighter-knit families such as Rahnelo. Ussan Sangheili, who diverged from the mainline Sangheili culture at the dawn of the Covenant, are allowed to know their fathers, presumably because they wanted to be sure who was descended from legendary figures such as Ussa 'Xellus and Ernicka the Scar-Maker and to possibly avoid inbreeding given their limited numbers. Both male and female Sangheili are taught to fight from a young age. Though only males go on to become warriors, it is believed that the females should be able to defend themselves in the event their keep is attacked. A popular pastime for Sangheili children is to hunt small rat-like creatures that live on their homeworld. Young Sangheili also learned and sang old narrative poems, the most famous and widely known being the legendary ballad of the demigod hero Kel 'Darsam. The Sangheili language, which served as a lingua franca to the Covenant, is rather harsh and guttural to untrained ears. While much remains unknown about its overall structure and conventions, it is known that certain sounds are largely absent from the Sangheili language due to their unique mouth structure; for example, Sangheili have difficulty pronouncing human words containing the letter "v" or ending with "p", resulting in the name "Evan Phillips" (As in Dr. Evan Phillips, a scholar of the Sangheili language) being pronounced as "Efanphilliss" (however, there are names in the Sangheili language that use these letters, such as "Vadam" and "Ripa"). Certain Sangheili colloquial terms have been translated by human linguists; the majority of these are derogatory in nature. The word "Jir'a'ul" is a term of abuse for Jiralhanae, being a portmanteau of the name "Jiralhanae" and the word "a'ul," the Sangheili word for a lump of wood. The Sangheili often refer to humans using the word "nishum," which translates roughly to "worm" or "intestinal parasite." The origin of this term lies with the first encounters between Sangheili soldiers and human military personnel. Upon first sighting human infantry, the Sangheili mistook their body armor for an exoskeletal shell. After examining dead human soldiers, the Sangheili discovered the relatively weak, fleshy creatures underneath the "shells" and came to the conclusion that they were some sort of internal parasite. Even long after this misconception faded, the term remained in use among the Sangheili as an unflattering insult to their human enemies. The Sangheili place great value in names and titles, and consider names to be a privilege given only to those who are worthy. The Sangheili generally regard humans as nameless, aside from generic labels, such as "Demon" (a term used to refer to Spartans). They resent that the humans have assigned the label "Elite" to them (along with many other, far more derogatory names, such as Squid-head, Split Lip, etc). A Sangheili's first name is a given name that is attained at birth and persists throughout adulthood. It is followed by a family name, which denotes their lineage. Thel 'Vadam, for example, was from the Vadam lineage. Some lineages, such as Vadam, have control over their own states, although this is not always the case; it is typical for Sangheili of other lineages to occupy smaller keeps in a state named after another lineage. Client keep elders within a given state typically adopt the name of the state instead of using their own family name. Family names may carry a suffix such as "-ee" (an honorific indicating that the Sangheili has enlisted in the Covenant military). Since the Great Schism, most Sangheili have dropped the '-ee' suffix. Additional titles, such as "Jar" and "Nar," appear to be related to specific ranks (Imperial Admiral and Fleet Master, respectively). Apart from the "-ee" suffix, the suffix "-ai" denotes swordsmanship, as with Bero 'Kusovai and Toha 'Sumai. Some Sangheili have names tied to heroes, battles, and legends that harken back to early Sangheili history. These more ancient family names often retain the idiosyncrasies of a more antiquated Sangheili dialect. The apostrophe in front of the clan name indicates a sound resembling a glottal stop or click. Sanghelios and its two moons, Qikost and Suban. Sanghelios is the homeworld of the Sangheili species with a population of under 4 billion as of 2558. Sanghelios is the fourth planet in a triple star system of stars Urs, Fied, and Joori. The planet has two moons called Qikost and Suban. As a space-faring species, the Sangheili have colonized multiple planetary entities as they ventured space, first expanding the reach of their own civilization and later that of the Covenant empire. There are several dozen worlds considered as major centers of their civilization. Like their homeworld, the colonies house a number of independent city-states as opposed to a unified government. Joyous Exultation was a significant nexus of Sangheili military during the Covenant hegemony's reign, while Hesduros is an example of a more remote Sangheili colony. Even before contact with the San'Shyuum the Sangheili had developed several types of starships like the Blockade Runner and Brigantine. After ties deepened with Arbiter Thel 'Vadam and his Swords of Sanghelios following the Human-Covenant War, his Sangheili artisans began to reap the benefits of cheap and simple human automation aides, revelations of Forerunner language and command codes that had been locked away by the San'Shyuum, and entirely new modalities of thought and systems of investigation. Using Forerunner knowledge reclaimed by humans a Renaissance has begun among Sangheili artisans eager to explore new avenues of knowledge, demolishing opaque rules and taboos that shackled their craft under the Covenant. Even as the Created move to control both species and safely circumscribe their destructive tendencies it seemed inevitable that the combination of iconoclastic Sangheili artisans and insatiably curious human engineers would lead to wonders and terrors yet undreamed of. The High Councilor was one of the highest positions attainable by a Sangheili in the old Covenant hierarchy. As members of the High Council, they shared governance with the San'Shyuum High Councilors and answered directly to the Hierarchs. The title of Arbiter was originally granted to the warrior ruler of the Sangheili clans, and was considered a great privilege. However the conflict caused by Fal 'Chavamee in his refusal of the Covenant religion, had led the Prophets to significantly repurpose the role. In times of an extraordinary crisis, it would be reserved for the most disgraced Sangheili and offered as a means to regain their honor through suicidal missions of great importance to the Covenant. It also served as a convenient means for the San'Shyuum to silence Sangheili in positions of power who may have started to question the Covenant religion or the Prophets' rule. As part of the Covenant Honor Guard of the old Covenant empire, the Honor Guardsmen were highly skilled warriors, hand-picked for the duty of protecting members of the High Council and the Hierarchs. 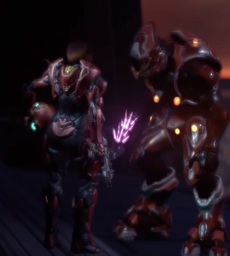 Although it was a great honor and they were expected to eliminate anyone who drew a weapon in the presence of a Hierarch, the position was seen by some Sangheili as merely a ceremonial duty too removed from battle. One of the most formidable groups in the Honor Guard is the Light of Sanghelios. In Sangheili culture, it is customary to promote individuals based upon their skills, abilities, and the number of casualties they inflict upon their enemy. In the original Covenant, a fresh Sangheili recruit would start as a Minor (indicated by their blue-colored armor). When a Sangheili had acquired sufficient experience in the field, he would often be promoted as a Major (indicated by their red/crimson-colored armor), leading fellow Sangheili and lower-ranked species alike as field officers. Should a Sangheili choose to focus primarily on combat rather than leadership, he may eventually attain the rank of Ultra, a class composed of the most skilled Sangheili infantry. A further advancement in the ranks is the rank of a General. They have been observed personally leading both warships and infantry on the battlefield. Whilst they can lead anywhere between hundreds to thousands of soldiers alone, when multiple Generals are required, they will fight in concert to resolve battles. One of the highest ranks attainable by a Sangheili, an Imperial Admiral bestows the control of large combined fleets and operate on powerful capital warships, such as an assault carrier or supercarrier. Rather than require groundside combat proficiency, they are requested to be tactically excellent and to hold a great influence over the vastly numerous troops within their command. The only known Imperial Admiral is Xytan 'Jar Wattinree. These military titles are retained for individuals who have garnered enough field experience and are not based on their military ranks. Weapons Master: Sangheili engineers who maintain and improve equipment used by the Covenant. Artillery Master: Sangheili who oversee artillery pieces. Field Master: Sangheili who lead land-based armies. Shipmaster: Reserved for Sangheili commander of individual ships, though they sometimes command small task forces, as well. The term "Shipmaster" is not exclusive to Sangheili, and is universally used by the Covenant to refer to an individual of any species in command of a starship. Fleet Master: Given to a high-ranking Sangheili in command of a fleet. Supreme Commander: The Covenant's equivalent of the human "Commander-in-Chief". The most well known Supreme Commander was Thel 'Vadam, who commanded three fleets during the Fall of Reach, while serving as fleetmaster of his own Fleet of Particular Justice, which he took to Installation 04. Managed under the Ministry of Fervent Intercession, the Zealots are a specialized group of Sangheili tasked with the search and recovery of Forerunner artifacts. They are involved in deep-infiltration, high-risk operations, sometimes led by a Field Marshal. In addition to artifact retrieval, the Zealots can also serve in other command roles. In the new Covenant order led by Jul 'Mdama, most of the Zealots originate from Hesduros. The Special Warfare Group is a military organization responsible for overseeing all special operations for the purposes of achieving the objectives for the previous Covenant body. A part of Covenant's Fleet Security, the Rangers are a group of Sangheili specializing in zero-gravity, exoatmospheric environment and extra-vehicular space combat. Their suits provide a great degree of mobility in such extreme environment. The Fleet Security's cover units are the Stealth Sangheili. Their role focuses on acquisition of intelligence and strategic countermeasures than direct combat. Like the Special Operations, they utilize active camouflage in their operation. The Ossoona, or "Eyes of the Prophets", is a subset that operates under the Stealth Sangheili for the purposes of information gathering on enemy weapons and military data. After the collapse of the old Covenant empire, the role of Rangers persists in the Covenant remnant faction led by Jul 'Mdama. The Special Operations are the Special Warfare Group's division for unconventional warfare. Comparable to Zealots, the Special Operations are tasked with suppressing enemy progression and disable enemy installations. The division is controlled by the Special Operations Commander. Special Operations Sangheili operate in small squads and boast superior shielding system and active camouflage. They are often led by Special Operations Officers and supported by Special Operations Unggoy. The Commando Unit is a branch of the Special Warfare Group based upon pre-contact ground forces. The Ascetics are a special group of Sangheili devoted to ensuring stability and purity within Covenant society. At the formation of the Covenant, the Writ of Union termed the dissolution of their order. Instead, they were reconstituted as an organization under the Ministry of Abnegation. The wake of the Great Schism brought the return of the Ascetics as an independent group. Advisors to the Hierarchs, the Oracle Masters specialize in intelligence gathering and providing religious counsel to the Hierarchs. Prison guards, as their name suggests, provide security for Sangheili prisons such as Weeping Shadows of Sorrow. French Les Élites in all media. 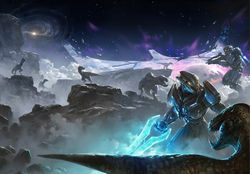 Check out our collection of quotes related to Sangheili in its quotes page. The dialogue spoken by the Sangheili of Halo: Combat Evolved was made by reversing and slowing sound clips of Sergeant Johnson. "Wort! Wort! Wort!" is the reversed phrase, "Go! Go! Go!". With the IWHBYD Skull turned on in Halo 3, they will occasionally say their trademark, "Wort! Wort! Wort!". Jason Jones at first wanted the Sangheili to have tails, but Shi Kai Wang talked him out of it by arguing that the Sangheili would look too animalistic, as opposed to being an advanced, intelligent race. An additional point was that when the Sangheili sit, the only place their tails could go was folded between their legs, creating an inadvertently phallic appearance. Over the course of development for Halo Wars, the Sangheili character model used in the cinematics went through at least two revisions. The initial version seen in the announcement trailer was later revised, being far closer in size, proportion, and overall physiology to the portrayal of the species in Bungie's games than the version in the trailer. In The Duel the Sangheili Han, Fal, and Roh keep their mandibles closed, using only the front two joints of their lower mandibles to speak, giving them a more humanoid appearance. This is an example of artistic license intended to humanize the protagonist and those close to him. In Halo 5: Guardians, all Sangheili are depicted as similar to the phenotype introduced in Halo 4. This includes Arbiter Thel 'Vadam, who is portrayed as having Halo 4-style mandibles despite his updated model in Halo 2 Anniversary being significantly more accurate to his original appearance in Halo 2 and Halo 3. This is for reasons of time and resources and does not indicate a visual retcon. Canonically, the physical appearances and harnesses worn by the Elites and other species of both the Covenant and the Swords of Sanghelios during the events of Halo 5: Guardians would have been more diverse than depicted in the game. In most games the Legendary symbol features a Sangheili skull with a bullet hole through the left temple. In Halo 3: ODST, the skull is that of a human, while in Halo 4 it belongs to a Promethean Knight. The Elites are the first Covenant species the player encounters in most of the Halo games: while heading to the Pillar of Autumn's bridge in Halo: Combat Evolved; at Thel 'Vadamee's trial in Halo 2; in the opening cutscenes of Halo 3 and Halo Wars; and in the prologue cutscene of Halo 4, as well as the first level of gameplay. In Halo: Reach a camouflaged Elite can be found at the beginning of the level Winter Contingency, though only on the Legendary difficulty. According to the original edition of Halo: The Fall of Reach, Elites had not been deployed in combat against the UNSC prior to the Fall of Reach when John-117 encountered one above Reach, a claim ignored in subsequent media. The 2010 reprint of The Fall of Reach removes all references to the Elites being a yet-unencountered species. Although the player is not able to dual wield in Halo: Reach, Elites are occasionally seen dual wielding plasma rifles and needlers. In Halo: Reach, the Sangheili HUD compass has Covenant markings instead of cardinal directions. Sangheili night vision is also purple, as opposed to the green used by Spartans. However, Sangheili night vision is only available in Firefight Versus, when playing as Elites. The Sangheili HUD also features a target tracking system. Different incarnations of the Elites from Halo: Combat Evolved through Halo: Reach. An early Sangheili during Halo: Combat Evolved's production in 1999. Another screenshot of a Sangheili during an early development phase. Concept art of a Sangheili for Halo: Combat Evolved. Concept art of a Sangheili with a point defense gauntlet. Concept art of an older Sangheili design. Another concept art of an older Sangheili design. Finalized concept art of the Sangheili for Halo: Combat Evolved. A Zealot prepares to lunge in Halo: Combat Evolved. A Sangheili Minor fires at enemies with a Type-29 Shade in Halo: Combat Evolved. Comparison of the internal organs of in Halo: Combat Evolved and Halo: Combat Evolved Anniversary. A Sangheili multiplayer character model from Halo 2. A Sangheili in Second Sunrise over New Mombasa. Rtas 'Vadum and Bero 'Kusovai sparring together in The Last Voyage of the Infinite Succor. A Sangheili multiplayer character model from Halo 3. 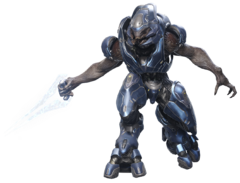 A Sangheili multiplayer character model wielding an Energy Sword. Model concept art of a Sangheili Minor from Halo Wars. An early cinematic render of a Sangheili from Halo Wars. A Sangheili executing a UNSC Marine in Halo Wars. Sangheili in Halo Legends: Origins. Concept art of a Sangheili in Halo Legends: Homecoming. Sangheili Honor Guards wearing a different type of ceremonial armor from Halo Legends: The Babysitter. Sangheili in Halo Legends: The Duel. Thel 'Lodamee, a Sangheili Major in Halo Legends: The Package. Special Operations Sangheili in Headhunters. A Special Operations Sangheili with Huragok and a Kig-Yar in Midnight in the Heart of Midlothian. Henry in The Mona Lisa. A Sangheili in The Return. Thon 'Talamee throws his brother, Reff 'Talamee, into a wall in Halo: Blood Line. A Sangheili Ultra in Deliver Hope. Concept art of a Sangheili face in Halo: Reach. Concept art of a Sangheili for Halo: Reach, showing some planned anatomical features such as the additional claws or the skin braids. Early concept art of several Sangheili designs for Halo: Reach. Concept art of a cut Sangheili armor permutation for Halo: Reach. A Sangheili Minor used to show how Sangheili were in Halo: Reach. A size comparison of a Sangheili from Halo: Reach and a SPARTAN-III. A Sangheili defeating another in Halo: Reach multiplayer. The model of an armorless Sangheili in Halo: Reach via a hologram glitch. Concept art of a Sangheili Minor from Halo: Combat Evolved Anniversary. A Sangheili Officer and Minor aboard the Truth and Reconciliation in Halo: Combat Evolved Anniversary. Sesa 'Refumee in Halo: Combat Evolved Anniversary's terminals. A Zealot in Halo 4: Forward Unto Dawn. A Sangheili Zealot in Halo 4. Jul 'Mdama in Halo 4's Terminals. Gek 'Lhar and Sangheili Storm in Spartan Ops. A Sangheili Minor in Halo: Spartan Assault. A Zealot in Halo: Nightfall. Rtas 'Vadum inspiring his fellow Sangheili in Halo 2: Anniversary. A Sangheili multiplayer character model from Halo 2: Anniversary. Ancient Sangheili being led by an Arbiter in Halo 2: Anniversary's terminals. A Sangheili Minor in Halo: Spartan Strike. N'tho 'Sraom during Operation: FAR STORM in Halo: Hunters in the Dark. Rho 'Barutamee in Halo: Fleet Battles. A Sangheili General in Halo 5: Guardians. Rtas 'Vadum accompanied by Tul 'Juran in Halo: Shadow of Intent. Two Sangheili of different phenotypes dueling in Killer Instinct. Sangheili training with Spartan-IVs in Halo Online. A Sangheili commands Banished T-32 Ghosts in Halo Wars 2. A comparison of in-game Elites across the Halo series. ↑ In most of their pre-Halo 4 depictions, the Sangheili have slightly laterally-oriented eyes. The Sangheili featured in Halo 4 and later media have more forward-facing eyes befitting a predatory species. ↑ In Halo 2 Thel 'Vadamee has magenta eyes and Rtas 'Vadumee has green eyes. In Halo 3 and Halo 2: Anniversary they, like all other members of their species, have orange-yellow eyes. A Sangheili Zealot seen in Halo 4: Forward Unto Dawn also has yellowish green eyes, Gek 'Lhar has yellow eyes, Jul and Rho have gray eyes and Vata 'Gajat from Halo: Escalation has red eyes. While 'Vadamee's and 'Vadumee's eye color was clearly retconned, the latter examples could be instances of artistic license, though they may instead indicate that other eye colors are exhibited throughout the species. ↑ Sangheili NPCs in Halo: Combat Evolved wear eye coverings corresponding to the color of their armor, while Elites of all ranks wear black lenses in Halo 2. These devices were likely meant to project the combatant's heads-up display. However, these coverings have not been seen in any media since Halo 2; Halo: Combat Evolved Anniversary and Halo 2: Anniversary instead depict all Sangheili with uncovered eyes. ↑ Canon Fodder "The resulting conflict would be called the Great Schism, and it would divide the Covenant into two, ultimately forcing the Sangheili out." ↑ Halo Graphic Novel, page ?? ↑ Halo Encyclopedia, page ??? ↑ 52.0 52.1 Halo: Blood Line, Issue 3: "Reff and I hatched on [sic] the city-state of 'Thasanee." ↑ Halo 4: The Essential Visual Guide, page ? ?